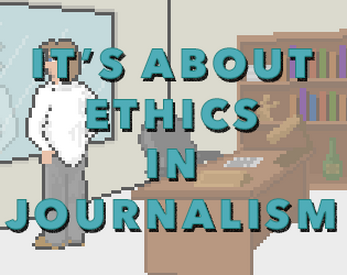 It's About Ethics in Journalism is about...well, you can guess. Assume the role of an ace newspaper reporter, and fight the scourge of fake news. You'll be able to pick from dozens of phrases to make your article come to life, but pick the truthful ones, because your editor won't let you go to press if you're putting out blatantly fake news. You'll also be scared on how catchy your piece is, because you've got to compete! Will you save your career? Will you save the media itself? Find out in It's About Ethics in Journalism!